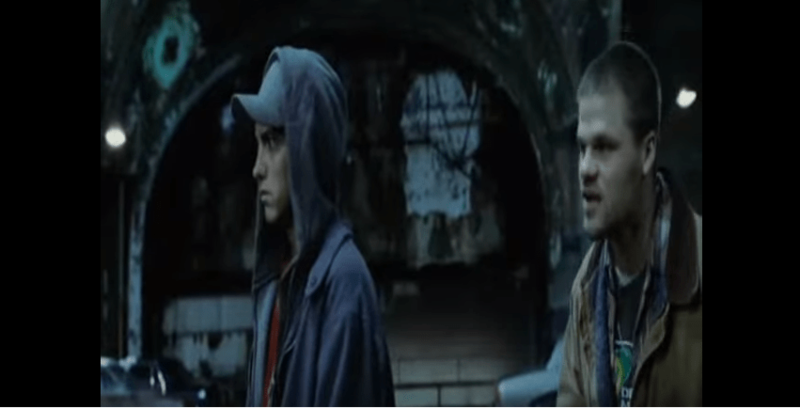 In November 2002 the movie 8 Mile, featuring Eminem, comes out. I was in China at the time, and who would have ever imagined that 10 years later I would be moving to Detroit. But it was indeed a hard choice to pick the soundtrack for this post. Did I want something that was only a decade old, or something older? I mean both Eminem and Frank Sinatra, and many others performed here, be it in a scripted freestyle or with up to 4,000 people in the audience. Eminem it is, the 8 Mile soundtrack. Another Gem. 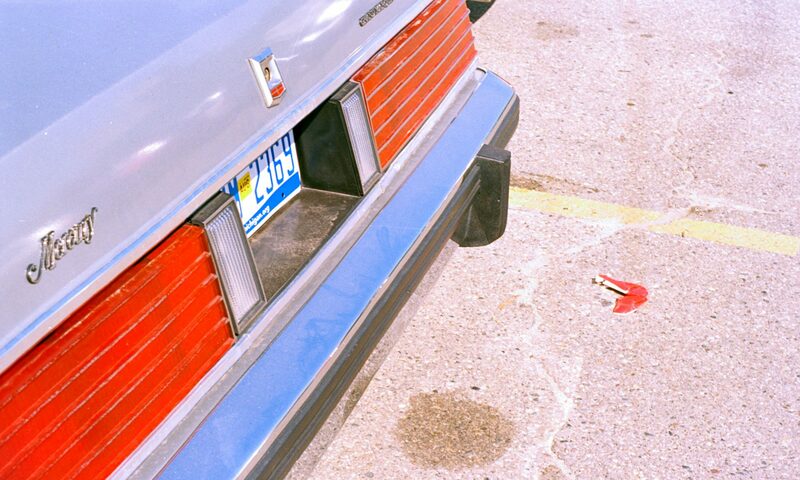 I had discovered another gem in Detroit. 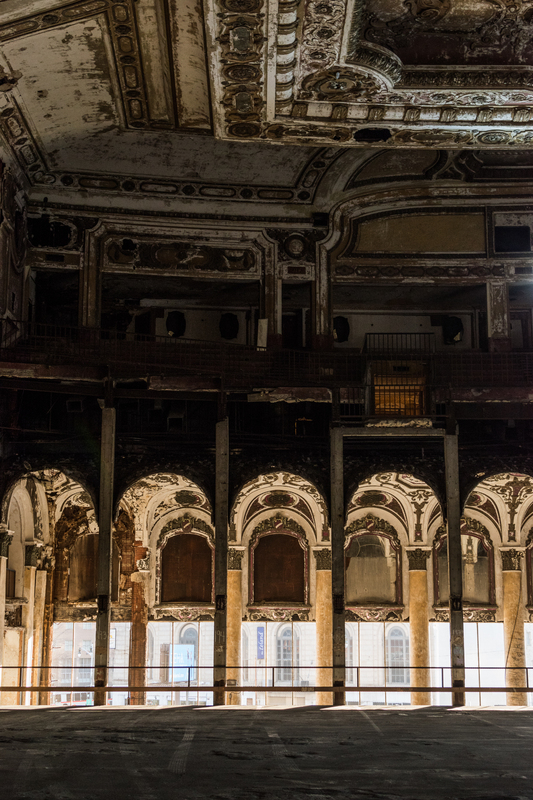 The once glamorous now turned parking lot Michigan Theater. 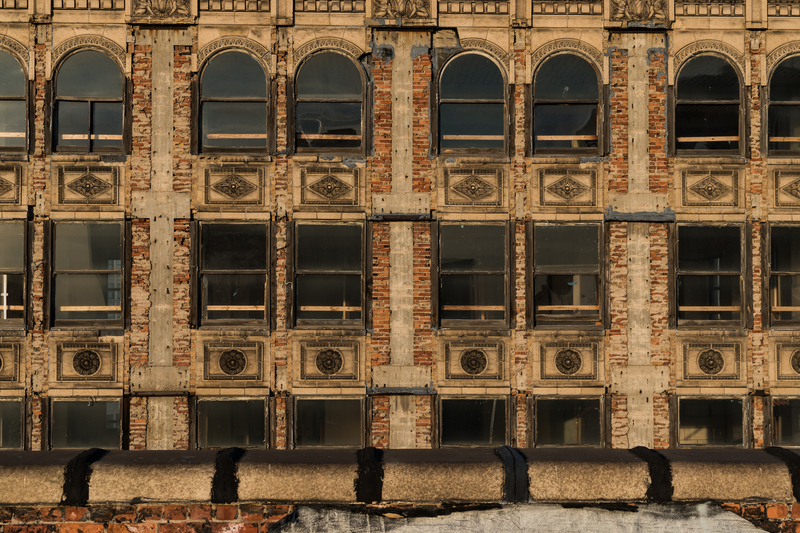 The building, between Grand River and Bagley in downtown, doesn’t appear to be much from the outside. 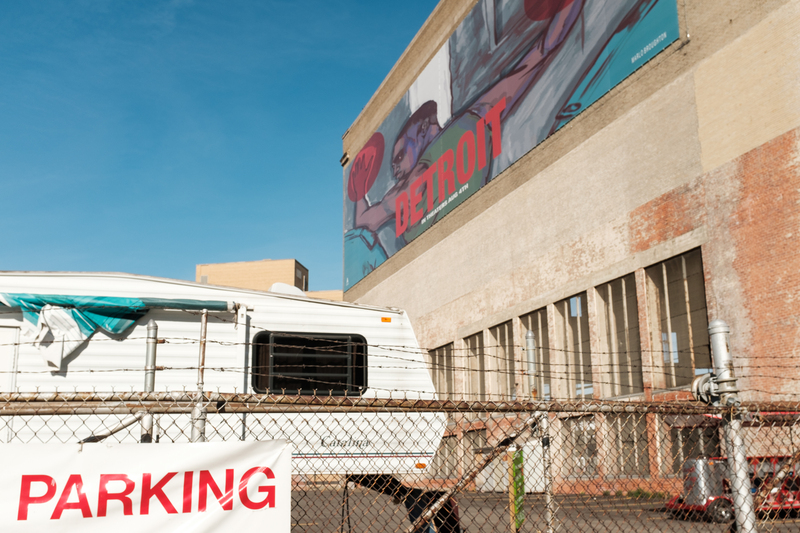 But in this photo I was looking for layers, trying to get an anchor, the parking sign, then something in the middle, the caravan, and then the Detroit billboard in the background. And it seems like it hasn’t changed much since then. 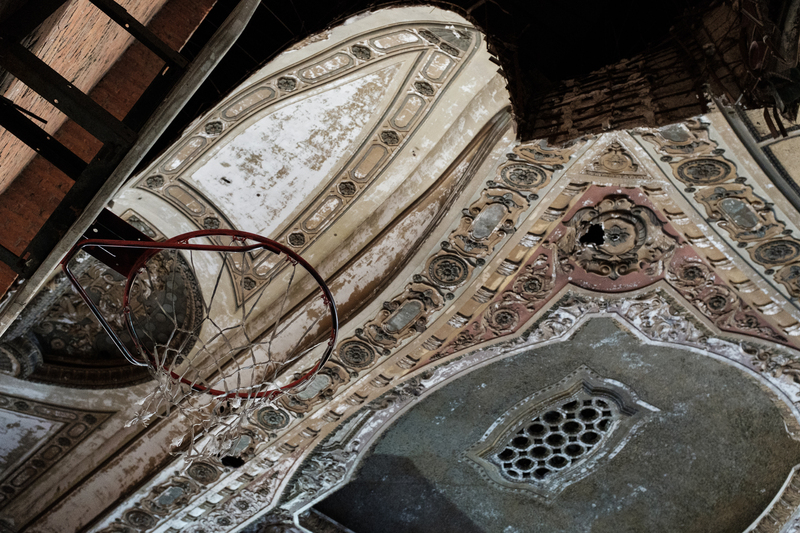 Can you imagine seeing Duke Ellington, David Bowie or Louis Armstrong playing here? The closest I got to it was, unknowingly, in 2002, when watching the scene from 8 Mile, when Rabbit (Eminem) has a freestyle rap battle in the same venue. Years later I would get a tip from a friend that I had to see the theater. I couldn’t wait. I looked and looked for it, but could only find a plaque outside, which in summary read: “this is the birthplace of the first Ford automobile”. The first time I went in it was through the parking entrance. 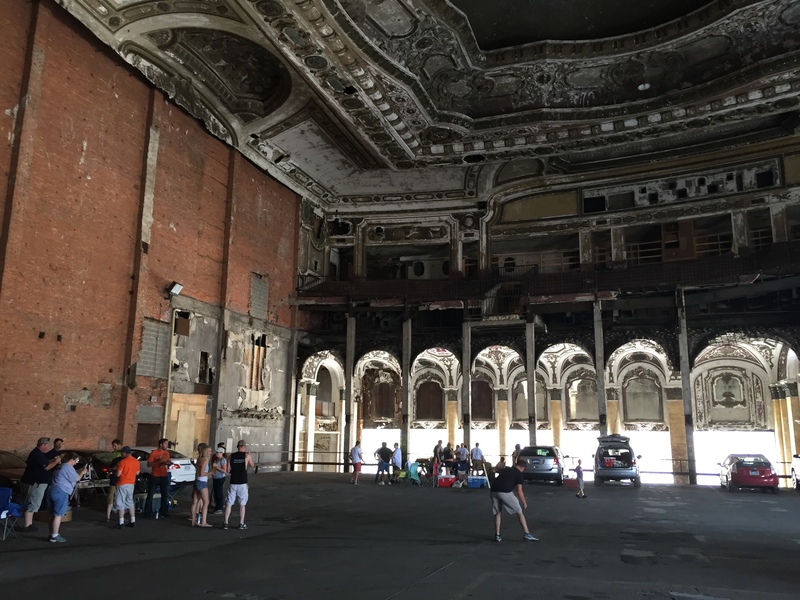 Yes, because the once majestic theatre is now a parking lot and it fills up when the Detroit Tigers and Lions play. People go there to tailgate. What a backdrop for some music, drinks and chips. To the left in the picture above is the actual entrance, or better yet, the entrance you go through when the parking gates are closed. That was the access I used another time when I went, in 2016. With my trusted Nikon 1.8 50mm I had to walk around to see what I wanted to make a photograph of. Attracted by the vertical extensions of the beams and arches I thought it would be intriguing to give a vertical feel to the theater. This time though, and pushed by the lens I had, the parking theater wasn’t enough. I talked my way into getting to the top with one of the guards and luckily they let me go. Getting to the ceiling and in the meantime making photos of the details of the building. 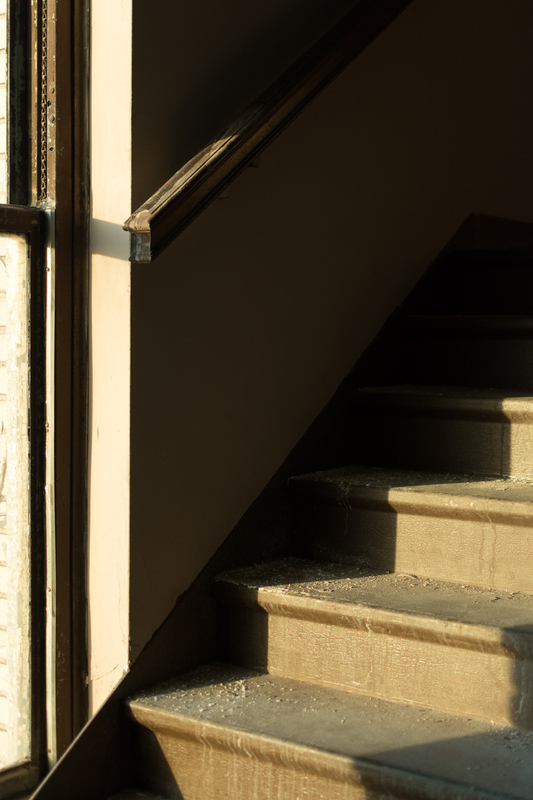 The first one, above, plays with the golden light coming in from the side window, and creating a shadowed pattern leading the top of the stairs. 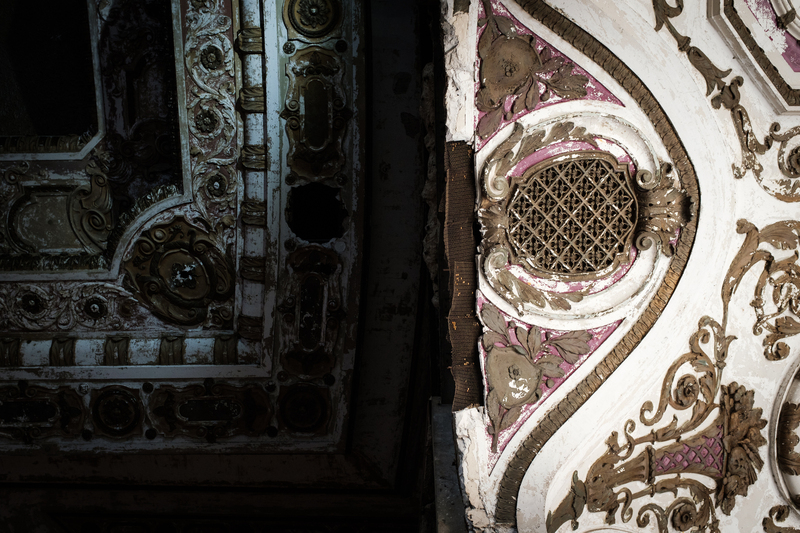 As always, the brightest part attracts the eye, which coincidentally shows the dust accumulated through the years of being abandoned. The second was of these corroded copper pipes. The separation between the first and the second pipe gives the viewer the depth and distinguishes the two elements. 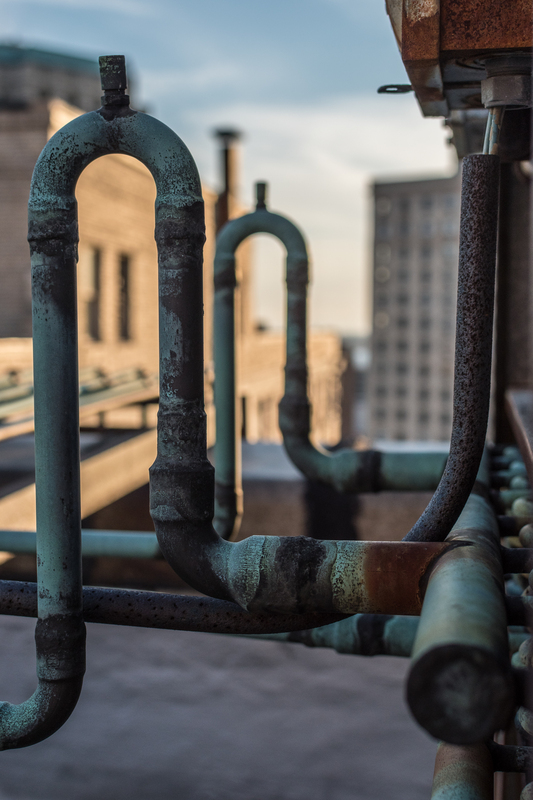 The shallow depth of field emphasizes the subject, the closest pipe. 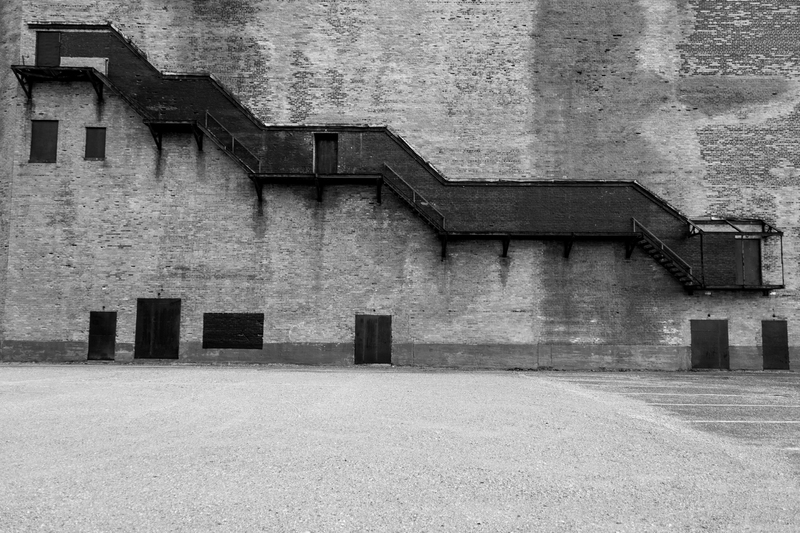 And to admire some of the architecture of surrounding buildings I made this other photograph. 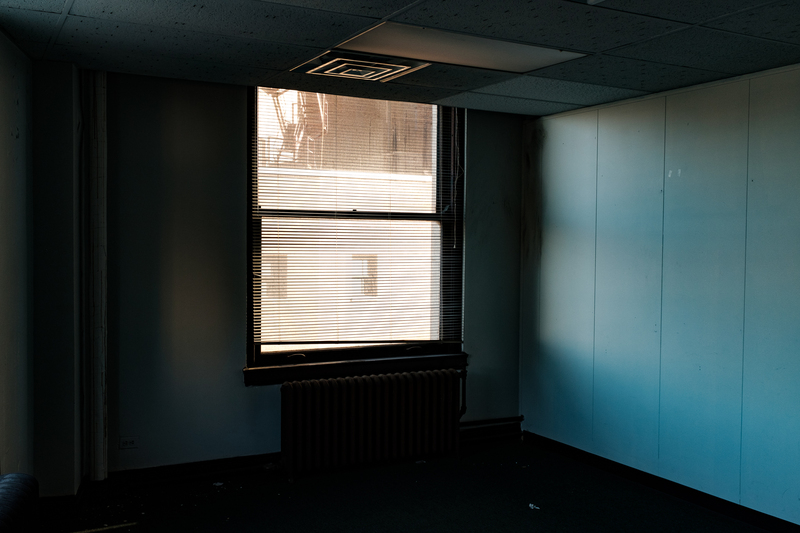 This one is also abandoned, but some of the details can still be picked up. I particularly like the arched windows more than the rectangular ones. In 2017 I went back, and this time I had my new companion, the Fujifilm X100F. Certainly a little wider than the 50mm Nikkor, but still not wide enough to capture the entire theater. So I was faced with similar challenges. Use my legs and eyes to enlighten my creativity and document the place. The hoop, the arch, and the circular ceiling provide a repeating shape which provides a visual anchor. In the visits so far I have yet to see someone play, but then again, why not have a hoop for anytime you go tailgating? And although it has been abandoned since then, it couldn’t be completely torn down because it could damage the adjoining buildings. The one that I also went to visit, just to discover through photography. Locked up entrances on the read of the Michigan Building, home to the abandoned Michigan TheaterThe first Ford historic landmark, turned in a theater, which through tough times and a lack of parking had to close, has now become a location for shooting movies and shooting hoops while tailgating.